Salon Blush, Holt’s newest full-service salon, offers more than just your everyday haircut. 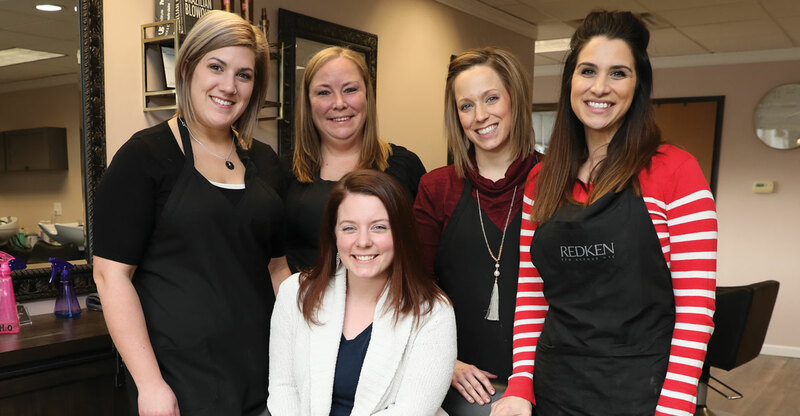 Their growing team of stylists also provide a line of professional products, color treatments, styling, bridal services, body waxing, and massage therapy. Salon Blush officially opened its doors in September 2018 and its stylists and estheticians are already hard at work servicing their growing client lists. As a chair rental salon, each stylist runs their own small business and manages their own clients within the salon. “It gives everybody a lot of personal room to grow their businesses,” McClure said. As each stylist grows into their own business, the entire team is encouraged to take classes and visit trade shows to keep their skills sharp. As the salon looks to expand their Holt-area clientele, McClure hopes to create a relaxed, inviting atmosphere for each person who walks through the door. “I wanted to create a very laid back environment, but something that’s still very professional,” she said. McClure started her career as a receptionist in a hair salon. She fondly remembers the relationships she built with her previous clients through small, everyday interactions. “I just really try to build a good relationship with all of the clients and all of the stylists,” she said. Over the coming months and years, McClure hopes to build her team of stylists and incorporate even more services, like eyelash extensions. Today, new and existing clients can book their appointments and browse the salon’s line of professional products online. Salon Blush is at 2040 N. Aurelius Rd. Suite 1-A in Holt, 517.709.3477, www.salonblushofholt.com.